A few weeks ago, my six-year-old son Michael looked at my t-shirt from our LibrePlanet conference and started asking me to name each of the various characters and objects shown in the t-shirt design. These characters are the mascots of various well-known (ahem) free software projects. Shame-faced, my memory slipped on a few and I had to go look them up for him. The symbolism of the t-shirt is reinforced by the tag line “Working Together for Free Software” and this is a theme that the Free Software Foundation is working to promote within the community — that we need to do a better job driving awareness and solidarity to the cause of software freedom. Free software is strong because of its values and because there are many heads to the free software hydra. For every project that goes moribund another two (dozen it seems) projects rise to take its place. But all too often we see high-profile projects, that are often corporately controlled, acting in ways that hurt free software, often putting their narrow self-interest ahead of the wider adoption of free software platforms, or promoting ancillary proprietary software at the expense of other free software projects. The most common problem is the lack of effort to educate users to the values of the free software they distribute. Leaving a typical user valuing the software only because it can be acquired for little or no cost. Our campaign for software freedom is not a campaign for freedom of choice. 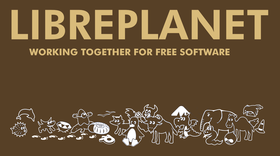 Free software isn’t just an alternative to proprietary software. Free software is a social movement, a movement to rid the world of software that would otherwise be used to divide us and keep us powerless. The software we use is not a matter of utility or convenience, it is a matter of securing our freedom now and ever more so in a future where we become increasingly dependent on the integrity of the software we run. In the US, we may have a Bill of Rights that prevents government from restricting free speech, free press or free assembly, but government can be ignored and these rights removed when proprietary software corporations have control over a citizen’s computing. We need to strengthen the free software movement for the long haul. The key to this is to impress software freedom values on our friends and all the people we introduce to free software. Our campaign asks free software supporters and projects to promote free software in ways that consistently emphasize everyone’s right to freedom. Telling all users that they deserve to have freedom and that they should be in control of their computing. Promoting free software as a civil liberty, that protects citizens from government and undue influence in their lives. Prioritizing software development for free platforms, and to recognize that the aim is to eliminate proprietary software like any anti-social behavior. Please join us in promoting our Working Together for Free Software campaign.